New Brunswick continues to follow the trend of the rest of of North America – another craft brewery is opening, this time in the Riverview area. Owned by long-time homebrewer Bruce Barton, Celtic Knot Brewing will be having its launch party this Sunday, June 23rd, at 3pm, at Marky’s Laundromat in Moncton. We recently exchanged emails with Bruce to get some details on what he has planned for beer lovers in the area. I know you have quite a history of homebrewing. How long have you been attached to this hobby? Bruce: I have been homebrewing on and off for 30 years now; I got more serious about it and moved to all-grain brewing about 10 years ago. What made you decide to move to a professional level? My decision to brew professionally was due to all of the positive feedback I have been receiving over the years, and the fact that I just love to brew. How far along are you in the process of selling your beer commercially? I just received my Provincial brewing license, which was the final step in the process… this took almost exactly one year to accomplish. Tell me a bit about the system you are using. I am using an all-electric Blichmann HERMS brewing system. 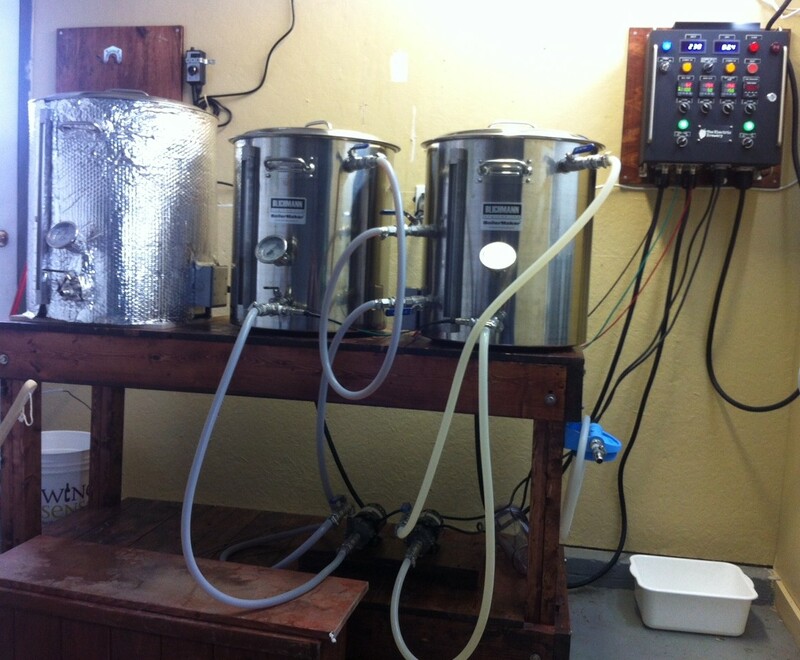 The HLT and the mash tun are 20 gallon and the boil kettle is 30 gallon. All hosing is food grade silicone, and water and wort are pumped around with two March pumps. The wort is the cooled through a counter flow chiller to end up in one of 2 stainless steel conical fermentors that are both 27 gallon. I can produce batches of 90 liters at a time. Can you tell me a little about your initial beers? Will you be concentrating on a particular style or styles of beer? I have two styles that will be ready by early next week and will immediately be available via ANBL in 20L kegs. The initial beers that I have brewed will be my “Not Joe Average” American Pale Ale and my “Hopicide” American IPA. I mainly concentrate on American and English style beers with a few specialty beers in the works. What are your plans for distribution (kegs, bottles, growlers)? Do you have any contracts lined up already in Moncton? Initially I will packaging in 20 liter kegs only for sale on tap. As of now I have interest from one pub and I plan to see what the demand will be before pursuing further contracts. I hope to supply the Laundromat full-time but I guess that’s up to Marc and how well the beers are received. I’m going slow as I’m in no hurry. Have any other brewers or breweries in the area helped you through the whole process? I would have to say I learned the most from my brewing buddy Gil back in my home town of Winnipeg. We brewed a lot and shared a tremendous amount of information making us both better brewers. We still chat beer at least once a week via email and text messages. I would say the most helpful professional brewer was Patrice from Acadie-Broue here in Moncton. He has been a valuable source of information regarding licensing and contacts. When it comes to the world of beer I would have to say that my interest was sparked by a festival we have back in my hometown, called Folklorama. This was a festival celebrating the multiple cultures of Winnipeg, with several pavilions each with ethnic food and drink. I would sample the different beers from each country and it opened my eyes to the fact that there are all sorts of styles and flavours in beers. From a young age I have been hunting for the alternative beers to the norm. Can you tell me more about your launch and initial beers? How about plans for future beers? Both launch beers are American in style. The “Not Joe Average” Pale Ale is 5% ABV and 19 IBU, and the “Hopicide” IPA is 6.4 and 100 IBU. The Pale Ale was crafted over a few years and is meant to appeal to both the craft beer and non-craft beer lovers alike. It’s brewed with five malts and is quite flavourful despite the low bitterness. I tend to make the English style beers in the fall and winter. I also have a few specialty beers that I will be brewing such as a spruce beer, a chinese green tea and goji berry beer, a Viking heather beer, and a pumpkin beer for Halloween. Welcome Celtic Knot Brewing! We imagine the launch party Sunday will be great, and folks will be clamouring for more. Keep up-to-date with Celtic Knot via their Facebook page. ← Friday Wrap-up — Uncle Leo’s Brewery Opening Soon, New Beers from PEI Brewing Co, Sea Level, Garrison, Pump House and more!